Wiring a ceiling fan and light can seem like a daunting task, but it doesn’t have to be. 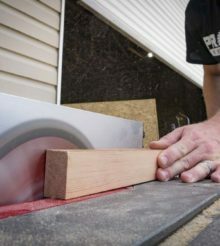 Pro Tool Reviews gives you a visual guide and step by step instructions on making the best connections for your particular ceiling fan installation. ON a scale of 1-10, the level of difficulty on this project is a 5, though it can be more complex if you include the ancillary projects such as running wiring through walls, etc. The main thing to consider wiring a ceiling fan and light is determining how you want that fan to be controlled. 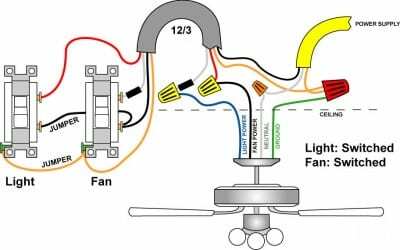 For some, that will be any combination from no switches (using the included pull chains for powering the fan and/or light) and having separate switches for the light and fan. Having the right tools will help the project to go smoothly and ensure you don’t get bogged down trying to use, for example, a razor knifed to strip wires, when a pair of wire strippers will do the job more accurately and about 10x faster. It’s always important to follow the local codes in your area when wiring a ceiling fan and light. Permits may be required for interior electrical work. When working with electricity, always remember to turn off the power, test the wiring with an electrical tester (or voltmeter) to ensure the power is off, secure the panel box so no one can accidentally re-engage power while you are working, and consult a professional to ensure you are doing things correctly and within the specifications of your state and local codes. Read all the instructions and safety information that comes with your ceiling fan. As you can see, it’s a simple connection that feeds power to both the fan and (optional) light kit. The ground and neutral wires simply get tied together as you’d expect. 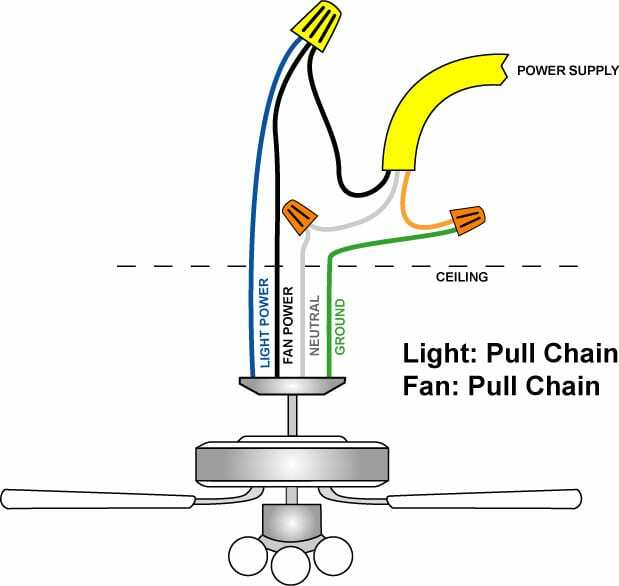 The power for the fan motor will typically be black, while most modern day fans will also have a separate blue wire that supplies power to the lights. It’s important to connect this wire even if you don’t plan on using a light kit as it gives the homeowner the opportunity to add one later on without having to remove and rewire the fan from above. As you can see, we switched the hot line going to the light kit by inserting the switch. Since many people are using simple 12/2 with ground to make this loop, we felt it important to show that if this is the case, you’ll want to wrap black electrical tape around the exposed white wire to indicate (to you or anyone else who works on the circuit in the future) that it is indeed a “hot” wire and not a neutral line. While we show a small strip of electrical tape, we recommend actually wrapping it around all the exposed white wire. Once you have wired in the switch, note that we have opted to attach the fan motor directly to the power source so that we’ll use the fan’s pull string to turn it on and off. This keeps the fan usable regardless of the position of the wall switch. Make your connections for the neutral and ground wires and you’re all set. Note that power is fed through the switch and both the fan motor and light kit are recipients of this switched power source. As expected, the neutral and grounds are simply tied together and all is well. 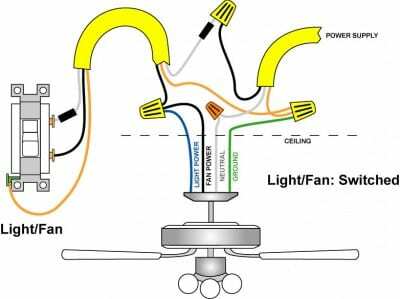 This is the most versatile way to electrically wire a ceiling fan with a light kit. It allows for separate control over both the fan and the light in the room. There are also lots of really convenient switches that put this dual control into one neat little package. Some even give you the ability to dim the lights – definitely a nice touch! There are endless choices when it comes to combination dimmers/switches you can use with your fan or fan/light. It looks more complicated, but don’t sweat it. The basic idea is that your power supply line is feeding both switches. Each switch then feeds either the fan (black wire) or light kit (blue wire). All that’s left at this point is to tie together all the ground wires and neutral wires (respectively). Keep in mind again that we assumed 12/2 with ground for the lines going to and from the switches, so be sure to clearly label them as “hot” wires by wrapping black electrical tape around the white ends. This is identical to situation #3 above, however we wanted to outline the wiring differences when the power is actually at the switch instead of in the ceiling. We find this method is encountered in roughly fifty percent of the time in older homes, especially those with electrical wiring originating in crawl spaces. Additionally, there is a sort of clean-ness to this method as it offers two helpful advantages: First, the wires are consistent – there is no re-labeling of neutral wires. 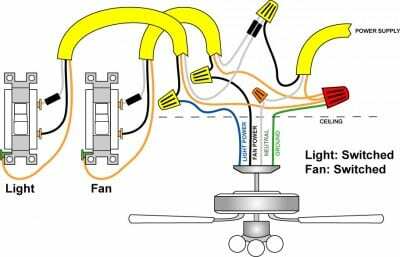 Secondly, this method of wiring makes swapping out ceiling fans easy as cutting power at the switch eliminates all power to the ceiling box. Note that we still recommend deactivating the breaker and checking your wires with a voltmeter, but it’s worth nothing nonetheless. Be sure to check the power source before beginning the job – even if you’ve already tripped the breaker. We’ve seen several cases where more than one power source was routed to a particular ceiling box and gotten quite a surprise when we reached inside! It’s also important to note that while some power supplies come in via the switch (and not from above) the basic methodology described here doesn’t change. What does change is that you can safely deactivate the ceiling fan box simply by turning off the switch. This is handy when replacing ceiling fans with a similar model, however we still recommend shutting down the breaker, lest someone walk in on you and attempt to turn on the lights! When stripping wires, we prefer to use a stripping tool as opposed to a razor blade. There are several on the market, from $2 tools that are simple stripping devices to fancier wire strippers that have cutouts for 10/2, 12/2 and 14/2 cable. Never use the included “wire nuts” that come with ceiling fans. They almost never have a metal inner winding and are commonly undersized, which makes them difficult to use, if not unsafe. Instead, be sure to grab a small assortment pack at your local home improvement or hardware store. While typically not necessary, we recommend taping any wire nuts after you make those connections. Wire nuts are normally very reliable, but it never hurts to add an extra layer of protection to keep them from ever unwinding. This is just a good habit to get into and costs next to nothing in terms of time or money to implement. Hopefully this guide will get you on your way to installing a ceiling fan and making all of the required electrical connections to get it up and running smoothly. A ceiling fan makes a great addition to almost any room and is one of the easiest projects to complete that can really make an impact in your home and make you look and feel like a real handyman. On method #4 with the 12/3 wire example, the labeling on the switches are backwards from the route I can see. The switch labeled light has the red return hot going to the black of the fan, and the switch labeled fan has the white taped return hot going to the blue of the light. I’m told by my builder if I have a remote I can only have one switch that controls both the light and the fan. To operate the light and fan independently I must use the remote. Is that accurate or just builder BS to an inexperienced female? I have two switches at the wall and a 3-wire with ground cable (similar to figure 4b) but my power supply is at the switches, not the ceiling fan junction box. How would I wire this scenario?